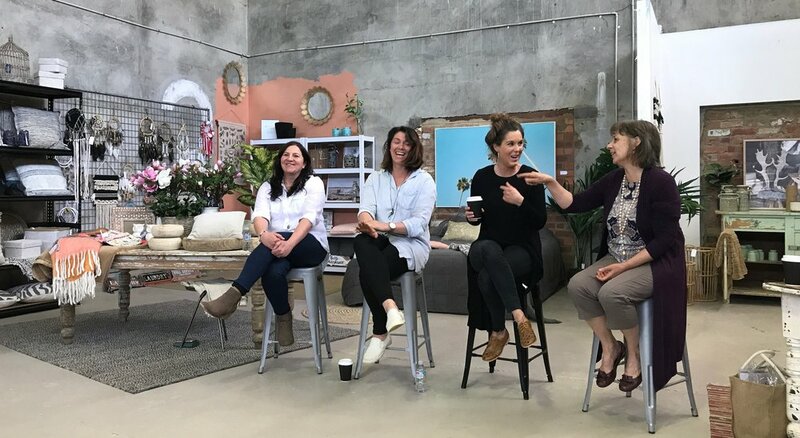 (L-R) Jenni Finn from Factory and Field in Cohuna, Lauren Mathers from Bundarra Berkshires in Barham, and Andrea Harrison from Kawaii Kids in Birchip, engaged in conversation with Kerry Anderson to celebrate the International Day of Rural Women on 15 October, 2017. 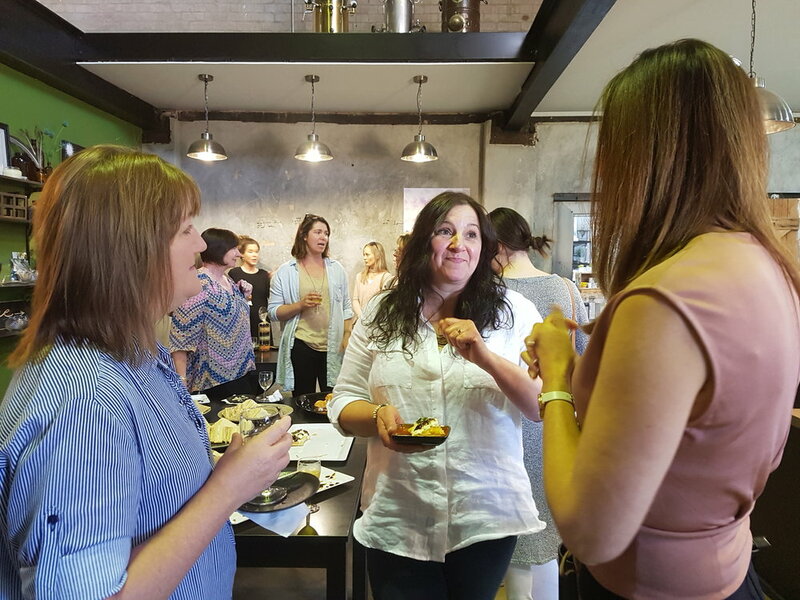 On 15 October, to celebrate the International Day of Rural Women, Kerry Anderson invited three female entrepreneurs to share their inspirational stories of starting a rural business. What a pleasure and privilege to have these three dynamic and extremely busy women together in a room sharing their passion for starting a rural based business. Their introductions alone were inspirational. When Cohuna teenager Jenni Finn got a casual job in an orange juice factory in the 1980’s she had no idea that one day she would own that historic building – originally a butter factory - and establish one of her home town’s most successful businesses in recent years. Tucked away on a back road in an industrial estate, Factory and Field is not exactly where you’d expect to find a popular home wares and gift store and that is part of its charm. Opened in somewhat of a rush in September 2013, Jenni’s vision is rushing ahead in leaps and bounds as she continues to bring her ideas into reality across the four acre industrial site. What do you do when you live in an isolated rural community and can’t buy shoes for your toddler? Well, if you’re Andrea Harrison from the agricultural town of Birchip, you start up your own online business, Kawaii Kids, importing children’s shoes and clothing. Operating from the family home; clothes were stored in industrial containers in the back yard and a laptop on a small desk in the hallway acted as a business hub. Fast forward a decade, Andrea has opened a retail store in Horsham and collaborated with retailers Australia wide to manufacture a specialist baby range. In 2009 a lone Berkshire sow ‘Doris’ was the beginning of what Lauren Mathers envisioned as a whole herd of free roaming black heritage pigs rooting about improving the soil. “Bundarra” is Lauren’s family free range Bio-dynamic farm on the Murray River just outside the small township of Barham in Southern NSW. The farm itself was dormant land that she and husband Lachlan saw potential in and, after years of patience, the farm was finally theirs. Not content with just breeding, Lauren learned the skills of butchery and in 2013 started processing all meat onsite. How did they gain the confidence to start a new business venture? Research has shown than over 30 percent of people are more likely to go into business if they know someone in business, most often a family member or close friend. In Jenni and Lauren’s case this happened to be their grandmothers who had also started businesses. ‘Nanna comes into Factory and Field and likes to remind me that it is all because of her,’ Jenni confided with a laugh. Confidence is a huge impediment to anyone starting out in business especially for rural women with no formal business skills. A classic attribute of an entrepreneur is a quiet self-belief in themselves. Rather than blindly take a leap of faith they avidly research to the point where they are both excited and confident that they have a great business idea. All three women alluded to this as they spoke about their vision and the determination to bring their new businesses into reality. ‘You have to have an appetite to take a risk,’ Lauren admitted. Andrea, who lays awake at night dreaming of all the things she would like to do, believes that you have to be passionate about what you do otherwise you wouldn’t do it. One of the biggest hurdles in establishing a business is accessing finance, and right from the start it became evident for each of the women that a business loan from a bank is not the answer. Jenni’s advice is ‘don’t accept the first no.’ Factory and Field was born in a bit of a rush; three months to be exact. She made the decision in July, purchased stock at a trade fair in August and opened in September. While the bank had been happy to support the purchase of the building, it wasn’t prepared to finance the business. Undeterred Jenni gave the building a bit of a tidy up and used her personal credit card to purchase stock. Thankfully she sold out on opening night and had the cash to stock up for the next influx. Andrea and Lauren also found alternate ways of funding their business activities. Andrea managed to self-fund the start of her business but recalls how a bank wouldn’t loan her money to expand despite the impressive cash flow figures she presented. Having no credit history was a bitter lesson. Financial pressure can be felt every time there is a major investment in stock or improvement to the business. Cashflow is crucial. At times Andrea admitted to anxiously waiting for the EFTPOS sales to be deposited into her account just to cover her expenses. While determined to keep the business separate from the family assets, at one point the family car was sold but thankfully it was a short term solution. 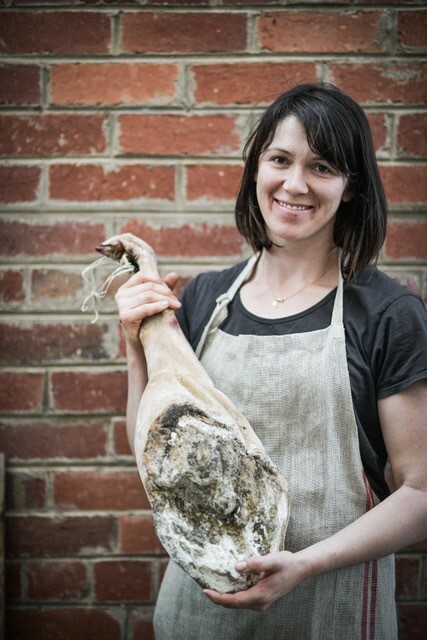 In 2014, a commercial kitchen was required when Lauren wanted to take her business a step further making traditionally cured pork products to sell online and at Farmers Markets. Cashing in on the great goodwill there is for free-range products, she used a crowd funding platform, Pozible, to successfully raise $18,000 ($3,000 more than required) for the project. The panel agreed that it was worth looking at other short-term options such as a personal loan or through an online lender such as Prospa. While the rates are higher, they are far more accessible. Balancing business and family life. With Lauren a mother of three, and Andrea a mother of four, they clearly rely on a lot of passion and drive to nurture a young family and business at the same time. It’s not always easy but business does have some advantages over a 9 to 5 job. Child care is also a lifeline for Andrea especially when she heads to the retail store in Horsham. Her time is much more flexible at home dealing with the online side of the business. Like many children of working parents their children grow up thinking it is normal to be in a work environment. Their mothers are role models demonstrating that it is possible to control your own destiny in a rural town. Jenni’s children were teenagers when she started her business giving her much more freedom to put in the long hours although she does admit that perhaps they were a little ignored. ‘I don’t think they really cared at that age,’ she smiles. Already her 16-year-old daughter is working part time in the business and has developed valuable skills. ‘My daughter is capable of running the business and has already done so when I can’t be here.’ There will be no shortage of opportunities as Jenni prepares to open another business, Factory and Field Waffles in the main street of Cohuna. Despite the hard work and frequent frustrations, Jenni, Andrea and Lauren clearly love being in business. ‘The best thing about being in business for me is the satisfaction I get from people picking up my garments in store and loving them, without knowing that they were once only an idea in my head,’ explained Andrea. It was of significance that this celebration was held at Factory and Field. Four years ago, as part of an Operation Next Gen conversation, I brought a group of local leaders to this vacant building and challenged them to look at existing landscapes with fresh eyes. Jenni did exactly that and, within six months, this old butter factory was experiencing another exciting chapter in its long history. With the vision, passion and determination of an entrepreneur anything is possible, especially with a supportive local community. Kerry Anderson, author of Entrepreneurship: It’s Everybody’s Business, works with rural towns all over Australia.